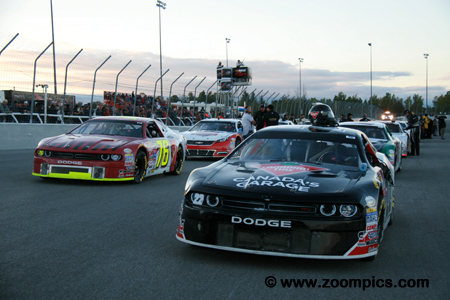 After eleven races, four drivers had an opportunity to win the 2015 NASCAR Canadian Tire Championship – Scott Steckly, Jason Hathaway, Andrew Ranger and L.P. Dumoulin. Competitors would race on Kawartha Speedway’s 0.375-mile semi-banked oval for 250-laps in the Pinty’s 250 at Kawartha. Twenty-two drivers were entered for the 2015 NASCAR Canadian Tire series finale. 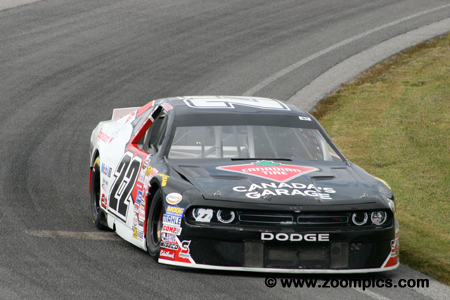 On the pole was the point’s leader, Scott Steckly driving the Canadian Tire-sponsored Dodge. 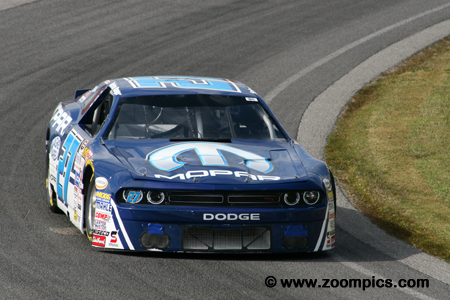 Sharing the front row with Steckly was another Dodge piloted by the rookie, Cayden Lapcevich. Behind Steckly and Lapevich are third and fourth fastest qualifiers, Gary Klutt and title contender, Jason Hathaway. The early season point’s leader, Jason Hathaway was one of four drivers in the hunt for the 2015 championship. Driving the No. 3 HGC/Williamson/Choko Chevrolet, Hathaway was just nine-markers behind three-time series champ, Scott Steckly. He qualified fourth and took the lead from Steckly on lap-48. Hathaway would not relinquish the position and captured his third win of the season – but fell short of the title. 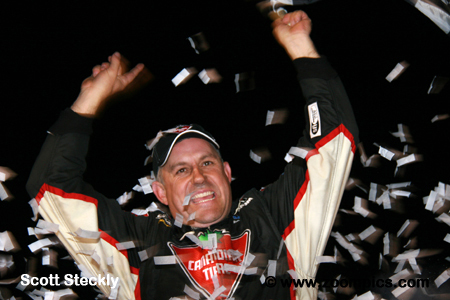 Three-time series champion, Scott Steckly entered the finale as the point’s leader. A finish of fifth or better would give Steckly a record fourth title. He grabbed the pole, his fourth of the season, by just 0.040-seconds. At the drop of the green flag, Steckly jumped out front and led the first forty-eight-laps. 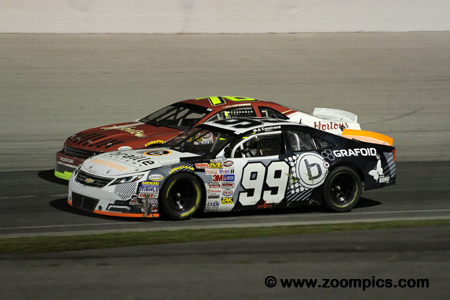 He was passed by Jason Hathaway and finished second but Steckly secured the championship by four points. 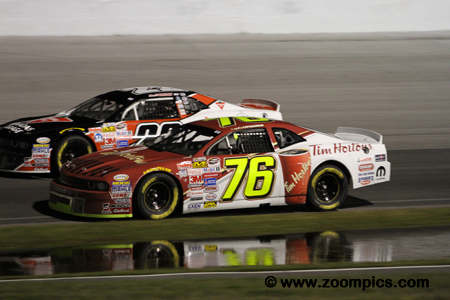 Rookie, Cayden Lapcevich competed in only six NASCAR Canadian Tire events during 2015 and scored a season-high finish of third at Sunset Speedway. 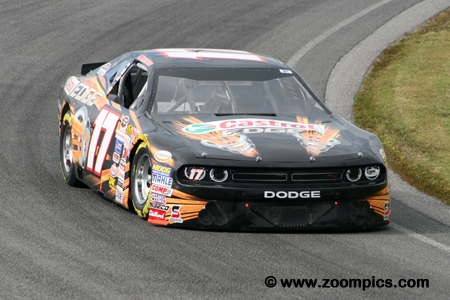 At Kawartha, Lapcevich qualified on the outside of the front row in the Tim Horton’s sponsored Dodge. During the race, his performance slipped and at the checkered flag, Lapcevich was in sixth place. Just nine-points behind the championship leader, Andrew Ranger was one of two drivers with the best chance of the securing the 2015 title. If Ranger accomplished this goal, he would be tied with Scott Steckly for the most championships – at three. Unfortunately for Ranger, he was never a contender during the weekend. He started and finished tenth. Ranger was third in the final standings. Another rookie, Marc-Antoine Camirand missed the two practice sessions. Without any track time, the driver of the Grafoid/Braille Battery Chevrolet could only manage to qualify twentieth in the twenty-two car field. However, it all came together for Camirand when it counted and during the race, he moved up fifteen-positions to finish fifth. His great drive earned him the Coca-Cola Move of the Race award. Two-time NASCAR Canadian Tire Series Champion, D.J. Kennington was winless in 2015 and Kawartha would be his final opportunity for a victory. The highlight of Kennington’s season was a pole at Riverside International Speedway and a third-place finish at Autodrome Chaudiere. In the season finale, Kennington was gridded eight but ‘true to form’ he moved through the field and equaled his best result of the season – third. Defending champion, L.P. Dumoulin had a mathematical chance of being the first back-to-back champ. However, at twenty-three points behind the leader Steckly, the other contenders – Jason Hathaway and Andrew Ranger had a much better chance of securing the crown. Dumoulin qualified fifth in the WeatherTech sponsored Dodge and finished fourth. He was fourth in the final standings. 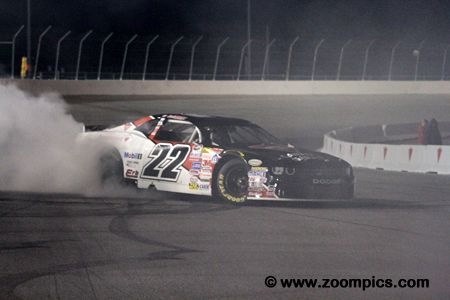 Scott Steckly celebrates his fourth NASCAR Canadian Tire Series Championship. 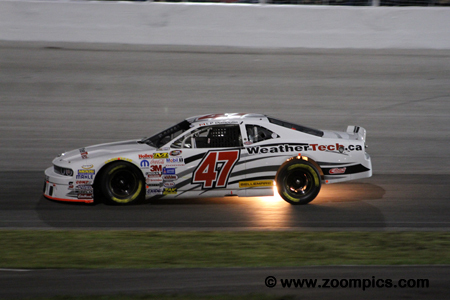 Steckly’s season started slowly with his worst finish a sixteenth in round three at Autodrome Chaudiere. His year turned around during the west coast swing when he won the races at Edmonton and Saskatoon. Steckly’s third victory of the year came in the penultimate round at Riverside International Speedway.